Way to degenerate the conversation.. any answer to the question posed? I guess I should ask OP. Yes there are part numbers for individual sections. Mid pipe, taile pipe, mufflers and such. And you are right, they aren't cheap. The only reason this one was cheap because it was coming from a donor in a junky. How many C43s equipped with PE can you find in the junkyards? We probably don't even have one. But the PE has far better built quality than any of the aftermarket options by a long mile. Thanks! I can see this being very popular in a couple of years for sure. But to your point, this isn't necessarily accessible at a reasonable cost in the current atmosphere. And I can absolutely see the appeal of doing such in a country like Australia that has much more strict motoring laws than the majority of states in the US (keeping a car OEM, or with OEM parts can save you many headaches). I did not check with mercedes about buying the parts from them. here is a pic of one of the mufflers that has a part number on it. If you cant get the numbers im happy to drive my car on ramps and get all the part numbers, just shoot me a message. The bracket that was different was not stamped from what i saw. 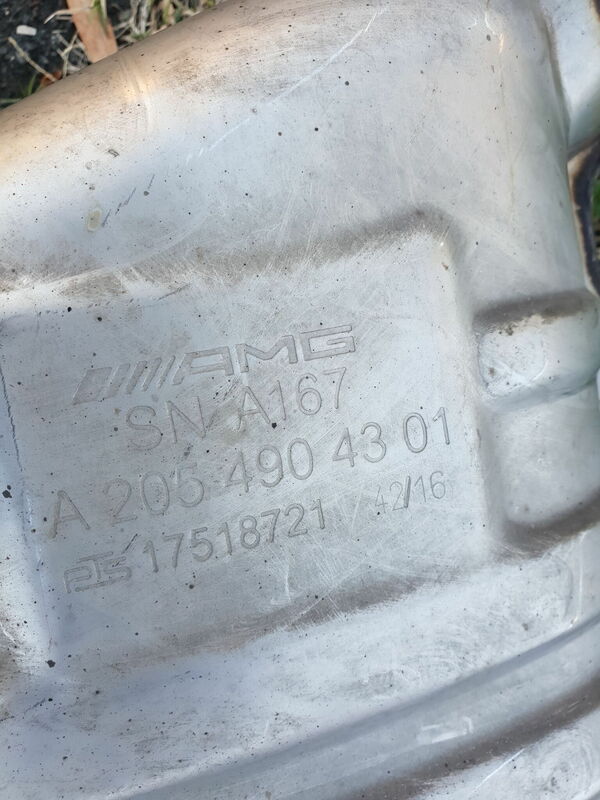 I love that it’s stamped with AMG. I can only imagine how many C63 lurkers are upset about that. Nice post. I do have a question about the hoodup of the module that you got from the donor car. How did you connect it to get power and did you install the button also? I have a C450 and purchased the Armytrix exhaust with valve control but I leave the value open all the time. I can see from your pictures that the Armytrix and the PE look a like with the large center pipe. I think the only big difference is the weight as the Armytrix center pipe is titanium which makes it very lite in weight. On the other hand, this is a great write-up as I also had a guy who purchased my C450 Exhaust for his C400 and noticed a difference in sound. No cracks or pops but a deep rubble and louder startups including louder revvs even during high speeds. He was very pleased that the C450 Exhaust made a difference on his C400. If you had purchased the C43 PE it would have cost you $1200USD so getting is for cheap is a good step. Also we need write-ups like this as a Auto Enthusiast forum so there should be no haters here. Many would be scared to take the step this guy did for fear they will loose money. Further to that, he shared his experience for others who were thinking the same thing. "Maybe I should have purchased the PE when I bought my C43". I think everyone should purchase the PE when they purchase the C43 AMG. For me, I wanted more sound from my C450 as I loss some sound with the Lorinser Tune however Lorinser recommended that I change my exhaust to a better breathing exhaust for maximum hp. I didnt end up hooking up the power button or the valve controller in the boot. For the power button, you need to replace the center console and have it programmed which MB would not do. The wiring for the valve controller in the boot is "stitched" into the main loom also, i took one look and thought im just going to bolt it up and cross my fingers it sounds the same. The valves are open all the time which makes startup louder. The sound characteristics of my car is the same as my friends with factory PE, my car is louder at lower RPM and make more pops etc at lower RPM. For 1200AUD I got lucky. Love this thread. Wish I could find a donor car with the Performance Exhaust. I haven't seen any wrecked w205s anywhere near me at any auto wreckers let alone one with PE. I'm currently shopping for a C43 and I'm wondering if there is a certain VIN code that identifies the performance exhaust. There is no specific number or letter in the VIN that would give that info just by its self. You can use a VIN decoder and all the info about options etc. will be shown. C43 and C63 use the same mufflers? Great thread and an awesome job done! The crack bangs and pops are generated from the actual physical PE exhaust not the valve module. The valve module closes the valves at lower RPM or when the button is off. Hi guys. I am from Hong Kong with non PE C43. I think I might be the only one in this forum retrofitted the PE exhaust by purchasing it from MB factory in Germany. Yes, my local garage helped to order the PE and installed it for me. Installation was a easy job. I finally picked up the car today and as said by Spaggettio, it transforms the car at all. When I first drove, the car feels strange to me because its sound super aggressive, the pops and bangs are really sharp. I kept watching the youtube for PE C43 for whole year and should already have had feel about it. But in reality, it likes 3 times louder than what I expected. The sound and pattern is exactly the same as those in youtube shotting PE C43. Actually, I would like to point out that, even the sound is amazing by now, I quite miss the quiet mode because in low rpm, even if in ECO mode, there is some drone. However, my garage said they cannot straightly adopt the market switch to turn it on and off. Seems the motor mounted on the PE exhaust requires a computer to operate rather than simply direct control. So, I hope is there anyone have some knowledge about this and recommend a way forward. Thank you guys! Great work on being able to order it. Have you heard the PE exhaust from a car that came with it from factory? I was also very surprised when I heard my friends car which he order the PE from factory it was very loud for a stock car, you can not judge by videos. This is why it is MB made it quieter in the new facelift model. The gear changes and pop and bang you have would be the same volume as a factory fitted car. The exhaust is a little bit louder low RPM because valve always open you can not do anything about it as it very difficult to try to retrofit the valve controller and button etc. Also it will get louder if you get an ECU tune. In Hong Kong, all C43 from dealer in stock are non PE car. Without further waiting for more than half year for a tailored made C43, most people prefer to get a readily available non PE C43. Besides, it is people perception that the aftermarket exhaust is always better than any exhaust from factory. So, actually there is not much PE C43 in Hong Kong, say only 30%. My garage is asking the supplier in Germany to see if there is any handy device be able to do the switch. I will keep you guys update. Weistec new C450/43 turbo upgrade- any thoughts?